Our recent American Grown Field to Vase Dinner at The Flower Fields in Carlsbad marked our 20th dining experience since launching the national tour in 2015. It was the second largest dinner we’ve held, with 175 people in attendance and a portion of the proceeds donated to The Flower Fields Foundation. The foundation helps bring students from urban communities to experience life on a flower farm. A fitting tribute to a cause that is not too dissimilar from our aim with the dinner tour. In fact, it’s the people part of the dinners we hold that continues to renew and encourage the continuation of the effort. Bringing consumers, designers, farmers and media to a dinner in the middle of a flower field does make a difference. Having our guests tour the farm with the flower farmer, learn from our featured floral designer and share the importance of what America’s flower farmers bring to their communities and the economy resonates. The conversations are lively and the experience is one-of-a-kind, and it’s in that environment that relationships are established, renewed or enriched. After each dinner, I look forward to receiving our album of photos and seeing the experiences of our guests through the lens of our photographers. Not only does the American Grown Field to Vase Dinner Tour bring people to some of the most beautiful flower farms in the country, it also highlights how important this flower-loving community of people who care and can advocate for American Grown Flowers really is. With the tour in its third year, I know for sure these experiences will have a tremendously positive impact on the relationships we’ve established for years to come. Click to see more photos from Carlsbad. America’s flower farmers recently lobbied in support for a Republican proposal for a Border Adjustment Tax that would help level the playing field with imported flowers. This phrase seems to sum up the relationship between the Society of American Florists (SAF) and America’s flower farmers regarding the Border Adjustment Tax (BAT) being proposed by House Republicans as a part of their “blueprint” on reforming the nation’s tax system. We’ve worked with a lot of designers over the last three years of the American Grown Field to Vase Dinner, but this was the first dinner where we partnered with our designer to host a design workshop prior to our main dinner event. We could not have had a better person to test this concept with than Debi Lilly of A Perfect Event. Debi was outstanding, and she did a remarkable job of hosting a sold-out audience of 60 guests for a three-hour design workshop prior to the Field to Vase Dinner at Gallup & Stribling Orchids. I really enjoyed meeting and working with Debi during last week’s tour stop in Carpinteria. She did a fantastic job acknowledging all of the farms that provided flowers to the design workshop, highlighting why buying American Grown Flowers is important and trending. Despite her status as a nationally branded celebrity event planner who has worked with the likes of Oprah and Lady Gaga, and her role as the creator of “Debi Lilly Designs” featured in Safeway, Vons and Albertsons throughout the country, Debi was a very down-to-earth, hard-working, gracious co-host. She was a wonderful team player who wanted to be involved in all of the details, helping us set up, troubleshoot and ensure that things were set beautifully before guests started arriving. Debi hosted a sold-out class of 60 people prior to the American Grown Field to Vase dinner on Thursday evening. We had a number of farms send us their flowers for Debi to use in her designs. Debi did an awesome job creating the tablescape using Syndicate’s American Made vases. It turned out beautifully. At the end of the evening, Debi shared her passion for supporting the American Grown Flowers movement. We’re already looking forward to working with Debi again. She did such a great job and was such a great spokesperson for the momentum and movement toward American Grown Flowers among consumers. California flower farmer Jerry Van Wingerden shares his passion for growing flowers with a group during this year’s annual farm tours in Carpinteria. Approximately 80 percent of all cut flowers sold in the United States are imported from South America, primarily Colombia. A national consumer research study found that 74 percent of people have no idea where flowers come from, yet 58 percent would prefer flowers that are homegrown. Origin matters. Whether you’re focused on quality, longevity, sustainability, local jobs or the economy. Origin matters. Look for the label when you buy your flowers. It makes a difference. This month’s Bloomin’ News features my experience flying with flowers. Bloomin’s editor Peggi Ridgeway contacted me after I posted my most recent experience giving flowers away on Delta Airlines. She asked if they could publish the story in the spring edition of their publication. The article is featured on the cover and can be found on page 6 in the magazine. So be sure to check out this month’s Bloomin’ News, a publication of the Original Los Angeles Flower Market of the American Florists’ Exchange. It was great to see such a beautiful spread in this weekend’s Santa Barbara News Press featuring Debi Lilly’s support for and involvement with our next American Grown Field to Vase Dinner in Carpinteria. Our next stop on the American Grown Field to Vase Dinner Tour will be at Gallup & Stribling Orchids in Carpinteria, California, on March 30. This stop is going to be a very special one as the tour returns to the place where the effort to host farm-to-fork meals on flower farms across the country began. The very first American Grown Field to Vase Dinner was held at Westland Orchids in 2015. So, it only makes sense that we’d have a very special designer helping to host our return to the nation’s “flower basket.” Debi Lilly of A Perfect Event will be sharing her passion for American Grown Flowers and her design talents as we host a beautiful dinner inside the orchid greenhouse at Gallup & Stribling. Debi has an impressive resume of design experience and work. For more than 10 years, she was Oprah Winfrey’s “Favorite Party Planning Pro.” She has also been the featured designer within the floral departments of Vons and Safeway throughout the United States with her Debi Lilly Designs Collections. The Certified American Grown Flowers blog has a great feature post on Debi this week, highlighting her work, “Meet Celebrity Floral Designer and ‘Oprah Winfrey Show’ Alum At Our Dinner In Carpinteria,” and I encourage you to check it out. I’m looking forward to meeting Debi in person for the first time at next week’s dinner. I’ve been in the industry for almost 10 years and have known of Debi’s work for about as long, so I’m looking forward to finally meeting her and working with her to host an amazing Field to Vase Dinner. Promotions for our Field to Vase Dinner Tour could be found in Vons and Albertsons stores throughout Southern California. Vons and Albertsons are sponsors of the Field to Vase Dinner in Carpinteria. A big thank you to Vons and Albertsons for their support of American Grown Flowers and their sponsorship of the Field to Vase Dinner in Carpinteria. It’s hard to believe we’ve been hosting free flower farm tours for nine years now, but what started as a simple way to welcome the public onto our flower farms once a year has turned into an annual tradition that’s going on a decade. This year’s Los Angeles Times article encourages the public to tour Carpinteria’s flower farms. The tradition has had some culminating impacts that could not have been foreseen when the idea was first imagined. The tour now welcomes thousands of people, not hundreds. Nonprofits are involved to help raise funds for their causes and media coverage is garnered from major news sources like the LA Times. The very first American Grown Field to Vase Dinner was held in a gerbera daisy greenhouse at the Kitayama Brothers flower farm in Watsonville in 2013 as a kickoff to that year’s Monterey Bay Greenhouse Growers Open House. In fact, it was the farm tours in Carpinteria and Monterey that helped give life to the idea of holding the American Grown Field to Vase Dinners we’re hosting all across the country today. Guests learn about the work and effort that go into producing flowers in California. 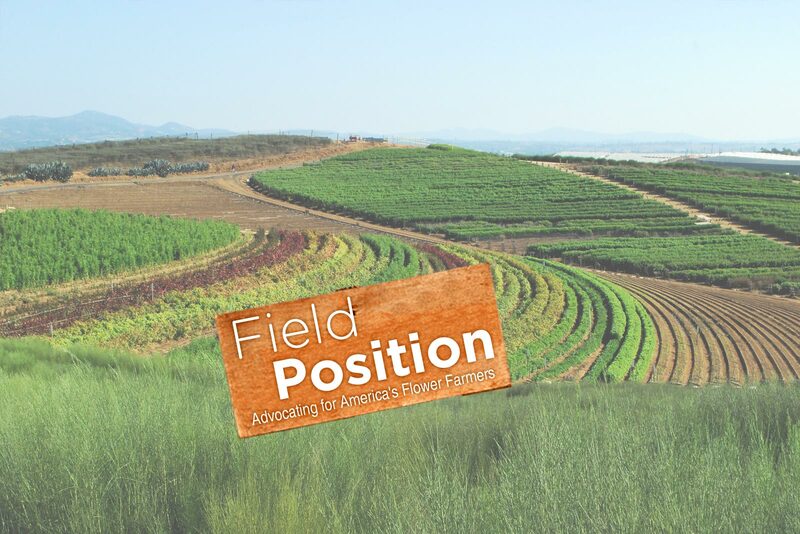 Not many seats remain, but if you’d like to join the American Grown Field to Vase Dinner in Carpinteria, make sure you visit FieldtoVaseDinner.com and reserve your seats. The 9th Annual Carpinteria Greenhouse & Nursery Tour will be held on Saturday April 1. Visit carpinteriafarmtours.com for a map of this year’s participating farms. So much to learn, so much to see during our annual farm tours. Here Alex Van Wingerden of Gallup & Stribling shares his passion for growing orchids. The 8th Annual Monterey Bay Greenhouse Growers Open House will be held on June 17. Visit montereybayfarmtours.org for a map and more information on this year’s free farm tours. Local Newspaper Highlights American Grown Efforts In Washington, D.C.
CCFC’s Governmental Affairs Chair Benno Dobbe was recently featured in the Colombian for his meeting with Congresswoman Jaime Herrera Beutler while in Washington, D.C., earlier this month. Woodland’s Holland America Flower Gardens owner Benno Dobbe, left, presented U.S. Rep. Jaime Herrera Beutler, R-Camas, with a scarf during his visit to Washington, D.C, as a member of the California Cut Flowers Commission’s Governmental Relations Committee. Congresswoman Herrera Beutler is one of the co-chairs of the Congressional Cut Flower Caucus that was established in 2014 to help raise the profile of and address issues facing America’s flower farmers. The congresswoman represents Washington State’s 3rd District in southwest Washington that includes Woodland, where Holland America Flowers grows its flowers. CCFC Governmental Affairs Chair Benno Dobbe of Holland America Flowers. Despite unusually high temperatures in Washington, D.C., at the beginning of March, Benno presented the congresswoman with a Certified American Grown Flowers scarf in appreciation of her commitment and leadership representing America’s flower farming families. The Certified American Grown scarf reminds people to take pride in their flowers. CCFC Governmental Affairs Chair Benno Dobbe of Holland America Flowers (left) with flower farmer Rene VanWingerden of Ocean Breeze Farms (right).